a) Is a swim test required? Participants are required to go through a swim test prior to being allowed in the boats. The swim testing will take place on in conjunction with the Senobe Summer Fun Day. b) Does my child need a lifejacket or lifebelt to paddle? All paddlers in the U16, U14, U12 and U11/Atom age groups must wear a flotation device. Parents must provide a PFD for all paddlers. Life belts are no longer accepted. PaddleALL participants must wear a PFD. c) Won't my knee get sore when I'm paddling? 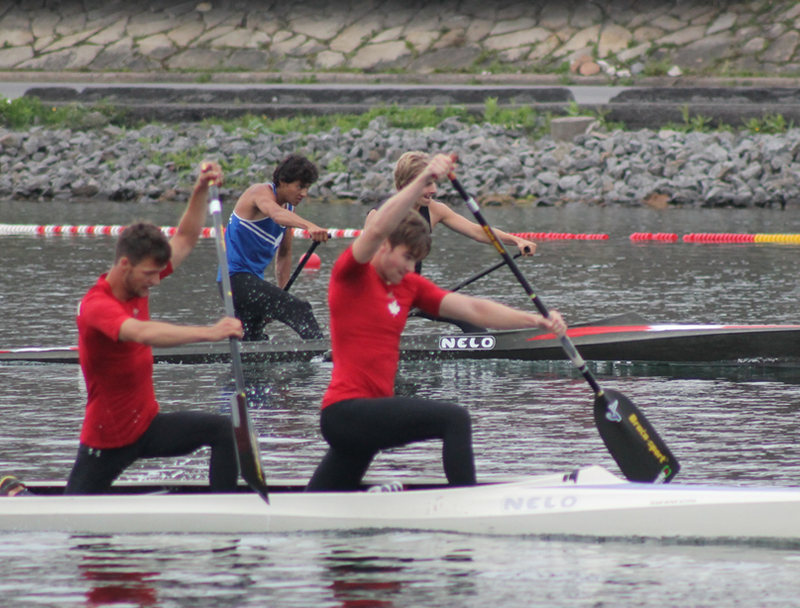 Paddlers kneel on a 'Block' or a 'Bun'. A 'Bun' is a soft cushion made from crushed cork and covered in fabric that fits under your knee while paddling a canoe. A 'Block' is a piece of foam that has been scooped out to fit under your knee. Senobe has a limited pool of 'Buns' and 'Blocks' available for use, but we strongly recommend that paddlers purchase their own. Senobe no longer offers these items for sale. d) What is a singlet? A singlet is a sleeveless, loose fitting shirt that Pee Wee paddlers and above must wear during the regattas (a paddling 'jersey'). Atom paddlers must wear a royal blue Senobe t-shirt during regattas. Please note that paddlers are not permitted to compete without a singlet or a t-shirt. Singlets and Tee Shirts are available for sale at Senpbe. e) Does my child have to participate in the regattas (races)? All paddlers are strongly encouraged to participate in the regattas, however, it is recognized that not everyone desires to compete. This is an individual choice that is best made between the child and parent with the input of the Head Coach. Paddlers are permitted to race in an older age group, but they can not race in a younger age group. f) If my child does not participate in the regattas am I still charged CKC/ADCKC fees? Yes, all paddlers must pay CKC (Canoe Kayak Canada) and ADCKC (Atlantic Division Canoe & Kayak Canada) fees with their registration. This money is is used to cover the cost of insurance, sport, athletic and coaching development. See CKC &ADCKC Fees for the current year fees. g) Why do I have to provide supervision for my child if they're under 12 yrs of age? All children under the age of 12 (at January 1 of the current year) require supervision for their safety and the safety of all members. The children are supervised by coaches only when they are on the water. Senobe offers a Member Summer Paddling Camp to meet this need. If your child will be 12 after January 1, 2019 they MUST have supervision. h) Are there lifeguards on the beach? Yes. Senobe Aquatic Club employs two qualified lifeguards who share lifeguarding duties. Senobe is a family club and welcomes children of all ages to enjoy the water. However, children under the age of 12 on January 1 of the current year must be supervised while at the club including their time on the beach and in the water. Parents are encouraged to watch all children while they are swimming. i) Are swimming lessons offered? We will not be offering, swimming lessons. Due to the popularity of our summer paddling program, we do not have the beach space to accommodate swimming lessons. j) What is the Off-Season program? Winter Session - November-April- dry land training. The competitive team generally trains in Florida for 4-7 weeks in the winter. For more information see link Off-Season Program. k) What is available at the canteen? The canteen is typically open 10:00am - 3:00pm Monday through Friday and during regattas. It offers a variety of simple lunch type food including grilled cheese sandwiches, bagels, pizza pockets, toast, etc. Our canteen also stocks snack food including chips, chocolate bars, popcorn , ice cream, candy and beverages including water, gatorade, juice, pop.Please check out the Canteen page on the website for more details and prices. During regattas we typically serve pasta. l) How does the tab system work? Parents can setup and prepaid a paddlers tab at the canteen. When the paddler makes a purchase, the canteen deducts the amount from the prepaid tab. We do not recommend that parents setup a tab for more than about $30 per week. Parents must ensure the paddler understands their expectations of spending. The canteen does not provide spending oversight. Paddlers are expected to spend responsibly. The canteen can not give your child money off of their tab. Tabs at Senobe are non refundable. Please see the canteen to setup a tab. m) How do I stay up to date on what's going on at Senobe? Your primary source of information will come from our Senobe Newsletters (sent periodically in the off-season and 1-2 times per week in the summer) and www.senobe.com. We also aim to email regular updates to members over the course of the summer and post them on the bulletin boards at the club. We also regularly update our FaceBook page, Twitter feed (@@SenobeAquatic) and Instagram (Senobe Aquatic Club). If you can't find what you are looking for, please email membership@senobe.com, for membership questions or senobe.communications@gmail.com ,for general information or speak to a coach or camp leaders, speak to a board member. We are here to help! n) How do I obtain a receipt? Our online registration system will email you a detailed invoice for the total amount due. If you registered and paid using PayPal, it will provide you with an electronic receipt. If you paid using a different method, please email membership@senobe.com for a receipt. o) What should I expect on the first day? Your paddler should bring a kitbag or backpack with snacks, water, lunch, beach towel, bathing suit, a set of dry clothes, hat, sunscreen. Everything should be labelled with paddlers name. Before leaving the house PLEASE apply a complete coverage of sunscreen. Show you child how to apply and impress upon them the importance of avoiding sunburn and drinking lots of water during the day. When you arrive, if you are a Day Camper, please follow the signs to meet your Camp Leaders and sign your child in. If you are not a Day Camper, please go to the lower deck introduce yourself and your paddler to Coach Rob and the other coaches. Please be sure to arrive in plenty of time to get ready for your paddling lesson. Paddlers should be sitting on the deck ready for their lesson. p) Can I use the locker room and lockers? Lockers are available to rent at the time of online registration and will be assigned on a first come, first serve basis. The locker assignment list will be posted in the locker room on the first day. You may only use the lockers, if you paid to rent one. Remove all food and used food storage containers at the end of each day as these attract pesky fruit flies. All wet clothing, wet foot wear or wet towels need to go home each day - stinky! The walls or lockers are not for writing on. Personal items should be stored inside the lockers or in kit bags, not left lying around the room. Keep it neat! q) Can I store my boat at the club? Boat storage is available to full members for a fee. It is an option included in the online registration. The type, brand and color of the boat is required. r) How do I find out how my child is doing with paddling? Is s/he ready to move into a development group? Please drop by the club and see our Head Coach Rob Baert. s) Do I need to be a member of the Club to join the Learn to Paddle Camps? The Learn to Paddle Camps are designed to be 2 week long day camps for non members of Senobe. It's an opportunity for potential members (aged 7-11) to try paddling. t) Can I pay the Day Camp fee and not secure a Paddling Membership? Our Day Camp is available only along with a Senobe paddling membership.